I have some news that is a bummer. Apparently the long awaited second Jet Red album "Flight Plan" has been put on hold. It appears that the economy is hitting everyone and the record business is no different. Sun City Records has been out of communication so I am not sure what the f@$k is going on but a 2009 release is NOT going to happen. Meanwhile, Brad Lang contacted me and pointed out a new project he is doing. It is called Planet Zero. You can check out a sample by going to this page. You can't keep a good bass player down! Rock on Brad!! HAPPY HOLIDAYS TO ALL ROCKERS OUT THERE! Expect to hear songs from "The Lights" as well as "Jet Red" at all our upcoming shows. We just performed a small set at Stockton Art Society's "Art Walk" and debuted "Not The Only One" to great acceptance. 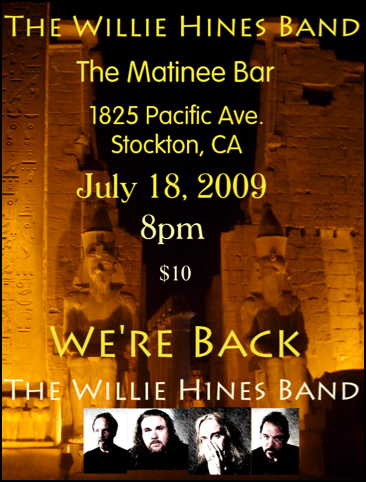 The coming show in Modesto will feature WHB doing "Wait For Me" which was a regional #1 hit from 1980 (with the original keyboard player from "The Lights" making a guest appearance). WEBSITE RELATED: Press Kits are now added! 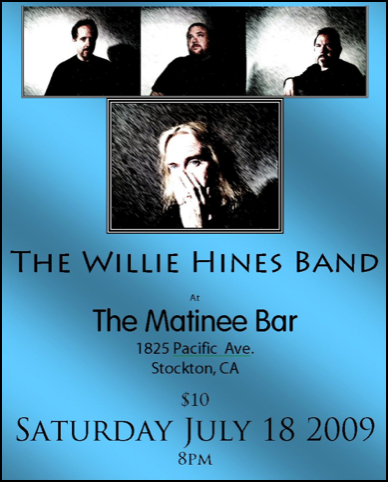 Willie decided many years ago that his solo work and the formation of The Willie Hines Band was going to be more about the future and his current feelings about what kind of music to do. He really didn't want to sterotype himself and his music as a throwback to the 80's. After the release of "Yeahright," Willie established that his musical tastes had changed and that he could and would write more eclectic songs. Our audience has also embraced that eclectiveness. "Halfway Around the World" a Celtic dance tune has establshied itself as a song that our fans expect us to play and they know the night is not over until we do. In recent shows, performing songs from the upcoming album "Whatever", "Hippie Chick" has established itself as a crowd favorite with a dominate 12 string acoustic guitar, Bo Diddley beat and a real southern rocker. But Willie and the band have now embraced the past. Songs from Willies band's of the past are now going to be part of standard WHB set. Thus expect to hear songs from "The Lights" as well as "Jet Red" at all our upcoming shows. We just performed a small set at Stockton Art Society's "Art Walk" and debuted "Not The Only One" to great acceptance. 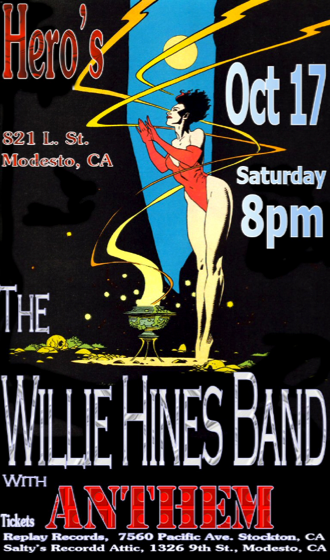 The coming show in Modesto will feature WHB doing "Wait For Me" which was a regional #1 hit from 1980 (with the original keyboard player from "The Lights" making a guest appearance). I suspect that songs from the upcoming new Jet Red release ("Flight Plan") will also make appearances in the future. In effect, "I Surrender" and embrace the past. Massive news in this week and what a great way to start the new year, with another big coup for Suncity Records (www.suncityrecords.com) with the signing of the awesome American hard rock band, Jet Red. As time has gone on, Suncity Records has grown in stature, allowing us to attract bigger and better acts. It's been about 2-3 years of on and off negotiations with the Jet Red boys and finally we have got them digging through the old studios, where these tracks were originally recorded. We stuck in there and we wound up hunting down the original masters and let me tell ya, they sound amazing!! Most rockers will know Jet Red for their self-titled debut album released on Relativity/Sony Records in 1989. The debut offered some catchy and tasty tunes, but paper-thin production values prevented the band from major success. So, like any proud band when backed into a corner and up against a wall, Jet Red rebounded and came out swinging with their very own, self-produced second album titled Flight Plan. In the time between albums, Jet Red's brand of AOR/Hard Rock became quite unfashionable and therefore Relativity/Sony dropped the band resulting in Flight Plan being shelved for all this time. Until this year, loyal fans have been eagerly awaiting a release date for the infamous second album, and I'm here to tell you - that 2009 is the year!! Recorded in 1991, the results of what Jet Red came up with in round two was quite jaw dropping!! It is no surprise at how talented Jet Red are in terms of song writing ability, but what really will knock owners of the debut out is the stellar production on the second album! It's quite evident that the boys really grew as a group in between albums and developed into an amazingly tight professional unit. One other thing that really stands out for me, is the newly improved guitar solos courtesy of Mr. Johnny Feikert - WOW!! When listing to Flight Plan, the first thing that comes to mind is Winger's classic Heart Of The Young album. So if you dug Heart Of The Young, I have no doubt that Flight Plan will be a big hit in your CD collection. Flight Plan is a perfect fusion of guitar driven Hard Rock with just the right amount of Keyboards so that the music is still very rockin'! A little known fact about Jet Red is that in the mid/late 80's when the boys were starting out, their original axe man was the GREAT Marty Friedman who went on to record with many great bands, but most notably became apart of the legendary Megadeth. Jet Red recorded a bunch of tunes back in the day with Marty before Dave Mustane poached him and they will be featured on Flight Plan as bonus tracks. Flight Plan will include the full 11 tracks that were to be the second album plus 3 bonus tracks that Marty did with the band right at the start PLUS this package will include a bonus DVD of a killer live show that the boys did in San Jose in the early 90's. All that for the same price of US$18.00!! "Ken, Brad here just sayin' hello. I was just thinking of you so I thought I'd drop you a line. Hope things are good in your neck of the woods. Fro has been playing with George Lynch of Dokken for the past couple of years, and it turns out that they were in need of a bass player, so I got the gig. We're going out for a couple of weeks in June along the West Coast. LA, SF, Sacto., Portland, Seattle and so forth. 2500 miles of driving........OH BOY!!!!!!!!! Willie and I are getting the artwork together for the release of JR2, so get ready. We're going through the live stuff to throw a bonus track or two along with the studio stuff. We'll talk later. Some pictures from "back in the day"....... Thanks to Johnny Feikert!!! I have made a few pseudo good quality sound bites from JET RED MACH 2- the unreleased 2nd album. Click here and let me know what you think! Also, I went to see Brad and Fro play live in Jeff Pilson's (ex-Dokken) band WAR & PEACE. They rocked!! I suggest you get the album"The Walls Have Eyes" on CD by clicking here. You will not be sad that you did. Also, I went to see Brad and Fro play live in Jeff Pilson's (ex-Dokken) band WAR & PEACE. They rocked!! The guitarist named Mitch Perry was outstanding. I suggest you get the album "The Walls Have Eyes" on CD by clicking below. You will not be sad that you did. 20 Questions with Willie Hines: CLICK HERE to see Willie's answers. Also, Brad Lang is currently playing with Jeff Pilson's (ex-Dokken member) band "War and Peace" and will be touring soon. To view Brad's bio, CLICK HERE. "Dear Ken; We have a bit of trouble in dreamland, my friend. Someone is selling a bootleg copy of Jet Red II on ebay; worse still, they've got some cheesy T & A style cover that is actually pretty professional looking, but just as bad as that stupid Relativity cover! Anyways, can you post something on the Willie Hines site that alerts people to the fact that the cd on auction is a bootleg, and that the legitimate version is forthcoming by the members of the band. That would really help. p.s.-let 'em know we hate the cover, as we would never put some inane sexist cover like that on anything we would release! Thanks, my friend, and get back to me. Peace...Willie :-)"
Thus do NOT purchase this from any other source other than myself OR Willie directly. Also know that a real legit release will be coming soon!!! Brad Lang and Willie are determining the best way to release this as I write this!! !